We got in touch with the folks at vintageaerial.com this week and looked at some historic photos of our farm. While I haven’t shelled out $350 for a print yet, it was very interesting to see that, in 1973, the south lawn of our property was a one-acre vegetable garden. This is approximately where we are currently growing strawberries, have put up a hoophouse, and are about to put up a second hoophouse. 37 years later, it’s nice to know that we have the same agrarian, back-to-the-land ideas as whoever lived here in the past! 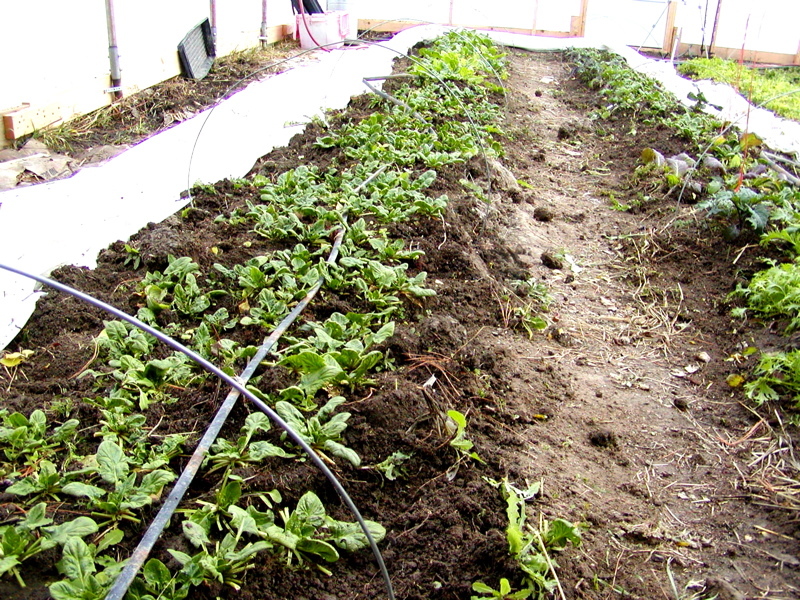 One of our experiments this winter has been growing produce in the ground in our unheated greenhouse. We first learned about this idea from Eliot Coleman’s writings, and got many more specifics from several of John Bierbaum’s presentations at the MOSES conference last winter. The whole idea of keeping vegetables of any kind alive all winter in central Indiana without supplemental heat when it’s below zero outside may seem a little crazy.. but what’s starting to seem crazy now is leaving the greenhouse empty in the winter! Take a look inside of our hoophouse, as of today. Spinach, kale, lettuces, arugula, chard, cilantro, and a few assorted mustard greens are growing right now. We’re standing in front of a hay bale wall. Later on in the spring, we’ll pull down the bales to build tables for our seed starting flats. Between the rows, that white stuff is polyester row cover. We put two layers of it on the wire hoops over the rows. Sometimes we use old greenhouse plastic instead, which is stiffer. Greenhouse plastic handles better when frozen and/or wet, but we don’t have enough of it yet for all of the beds. Watering is kind of a hassle, but we don’t have to water very often during the winter. We have an outdoor spigot about 100 feet away from the hoophouse. When there’s a sunny day above freezing, we haul a hose out to the spigot, hook it up, uncover the greens, and do the watering. 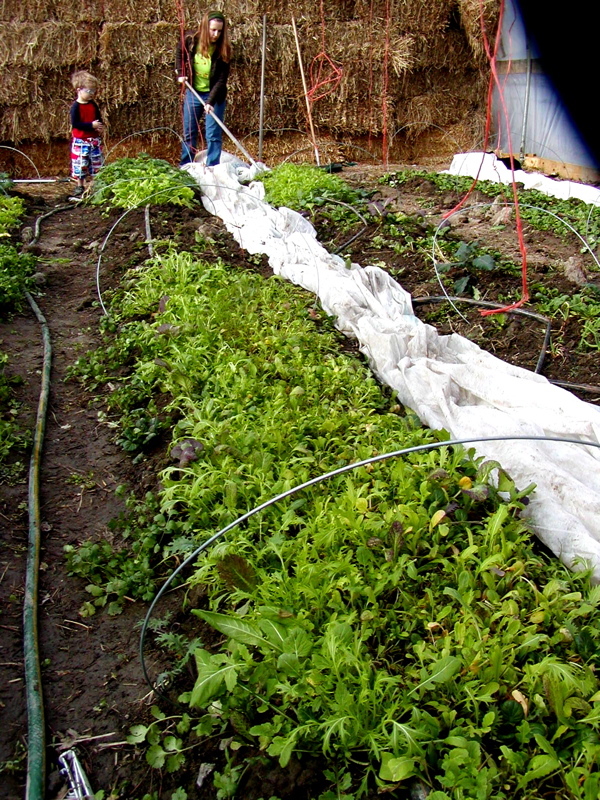 Then we unhook the hose, haul all the hose back into the hoophouse, and let the leaves dry off before covering the plants back up. We try to water every 10 days or so. The plants stay pretty moist with the two layers of row cover on. With this arrangement, the limiting factor in growing greens becomes day length. Right now, in early January, days are very short and everything is growing very slowly. Greens grown for cut & come again use just don’t grow back very fast. 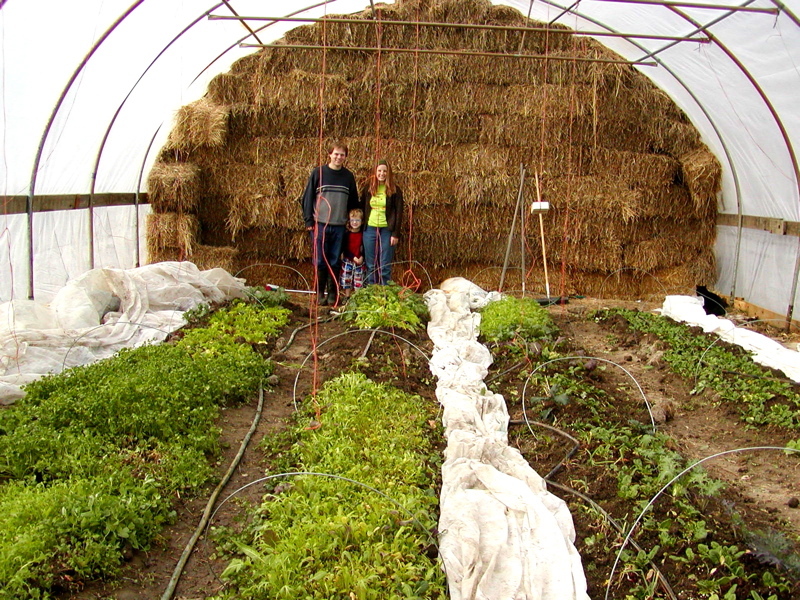 We’re planning to put up a second hoophouse during the 2011 growing season that is twice as long, so that we can have more greens and other items available throughout the fall & winter. 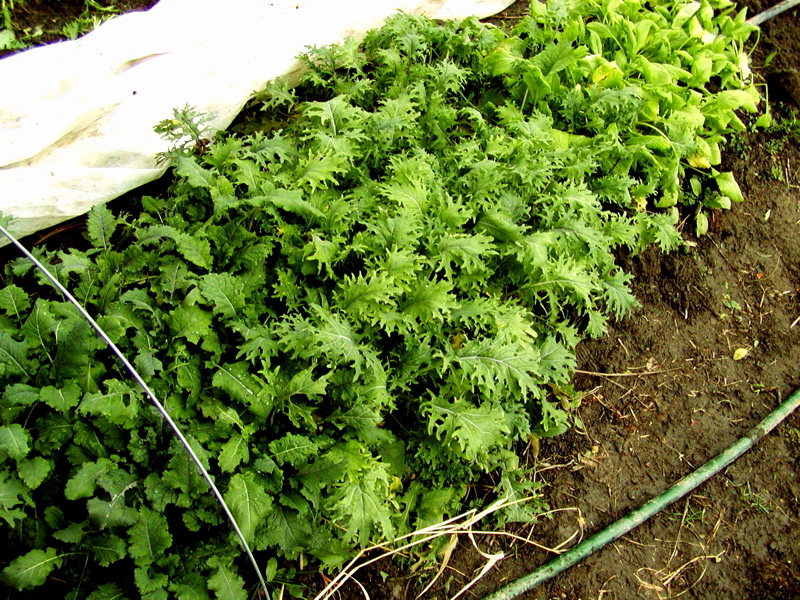 There are definite limits on what can be grown this way- notice that we are growing cold-tolerant leafy greens. We had radishes and salad turnips in the beds earlier, which also did well. Certainly nothing is in the beds that can’t handle a frost. Spinach anyone? It gets sweeter after every cold spell. The sugars are a natural form of antifreeze. However, kale is what will really get you to live forever. 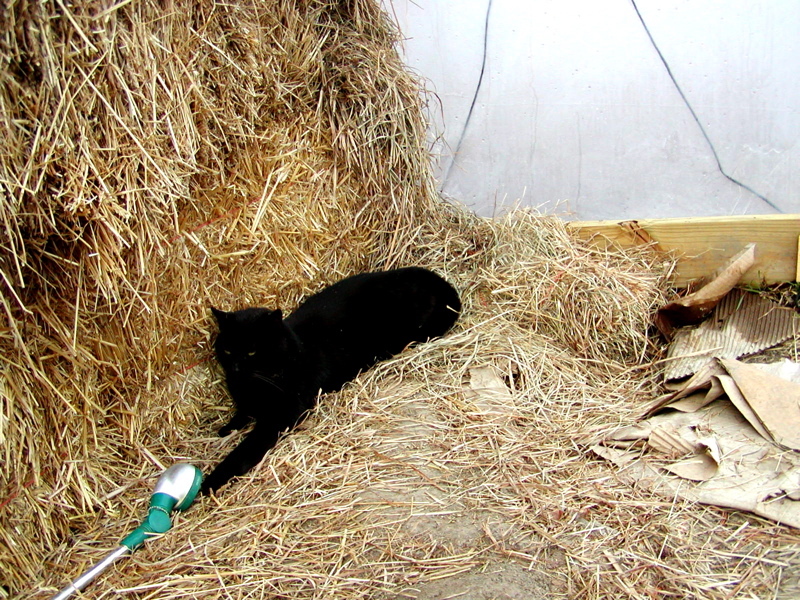 One, and only one, of our barn cats has figured out how to get inside. Some of the changes we’re making in our operation this year are in our equipment- upgraded cultivators, ways to improve drainage & handle wet conditions, and a transplanter that can be operated by one person. Some of the changes are infrastructure- tripling our hoophouse space and setting up a permanent chicken brooder area. What changes will you, our customers, notice? – Improved product availability & consistency. Leafy greens and beets should be available in much larger amounts and for a longer portion of the growing season. Summer squash, cucumbers, zucchini, & peppers will join tomatoes in being produced over a longer season. – New things. I can never resist trying a few new things. In the past, you’ve met husk cherries, vegetable gourds, long beans, and purple beans. This year, you may meet celeriac, fennel, edamame, parsnips, or lima beans. And, of course, there will be a few new varieties of tomatoes- Black cherry, yellow pear, and some corrugated striped monsters. – A little bit of beef. We have our 100% grass finished beef for sale from now until we run out of it at the Carmel market this summer. It’s very lean, with a fat content similar to elk or bison, has a healthy fatty acid profile, and just plain tastes good. If you’re someone who usually cuts the fat off the edge of your steak because the flavor bothers you, you’ll notice a big difference in grass finished meat… there’s a lot less of that fat to cut off, and it tastes amazing! – More eggs. While we still may not have eggs at the market every week of the summer, we have more hens & they’re laying better. As far as I know, we’re the only vendors at Carmel with organically-fed hens. – Chicken for sale! It’s our goal to have broiler chickens available starting in June. Unfortunately, a fire recently occurred at This Old Farm Meats & Processing, where we were planning to have our chickens processed, so we are uncertain if they will be back up & running by then. We will be looking into other options in the mean time. If the person is willing to listen, I am willing to engage them in a conversation about the difference between our $5.00 per dozen eggs and other eggs costing $4.00, $2.00, or even $0.99 per dozen. Our eggs come from chickens that live in mobile outdoor housing on pasture, and they are fed certified organic grains in addition to whatever they forage on they own. We feed the chickens organic feed for their entire life cycle, from when they arrive as newly hatched chicks until they leave our farm. It takes about 6 months to get them up to laying age, so this is a substantial investment. Some of our other friends at the market sell eggs that are raised in a similar manner, but don’t use certified organic feed. Feed is a major component of the expense of raising laying chickens, so that cost is reflected in the eggs. Our fellow market vendors who aren’t organic generally use high quality feed that’s free of animal byproducts, and some of them explicitly state this in their packaging or even mix their own feed on their farms. 2) The folks selling the eggs are not accounting for the cost of their time/ labor in raising the chickens & gathering the eggs each day. Their egg business is more of a hobby and less of a business. 3) The chickens are sometimes raised in confined situations in a building or in cages. If you don’t ask, or if you don’t see chickens running around, you don’t know. In the grocery store, of course, you can find the cheapest eggs of all. As some people know, and as some people ignore, the cheapest eggs in the grocery store come from caged hens who spend their lives in a space a bit smaller than a sheet of notebook paper, crammed up to 100,000 in a building. Producers using these methods certainly use economies of scale to create a cheap product. The animal welfare consequences are, of course, horrible, and the eggs themselves are pale imitations of ours. “Cage Free” eggs at the grocery store are most likely from chickens raised in these same confinement buildings without the cages, and with just a tiny bit more space. Conditions can be better, or can still be fairly awful. How about “outdoor access?” I’ve been seeing this phrase on grocery store egg cartons lately, too. The Cornucopia Institute has a nice video about this. Finally, I’d like to point out that we are not getting rich on these 5.00 per dozen eggs. We hopefully can pay our feed bills and maybe pay ourselves minimum wage for taking care of the chickens. Our friends who raise the 4.00 per dozen eggs are most likely in the same situation. The people who raise the 2.00 per dozen eggs are definitely not getting rich and are probably losing money. And those 99 cent eggs in the grocery store? I don’t even want to think about how many cents on a dollar go back to the farmer! We occasionally send an email newsletter, highlighting produce that we have available and markets that we'll be at. If you'd like to receive the newsletter by email, please sign up!